The perfect addition to the office of any busy tax pro! The Victor 14-digit calculator is great for the everyday advanced user. Features financial, loan and time calculations. Fast and quiet 8.0 lines-per-second thermal printer does not require ink. 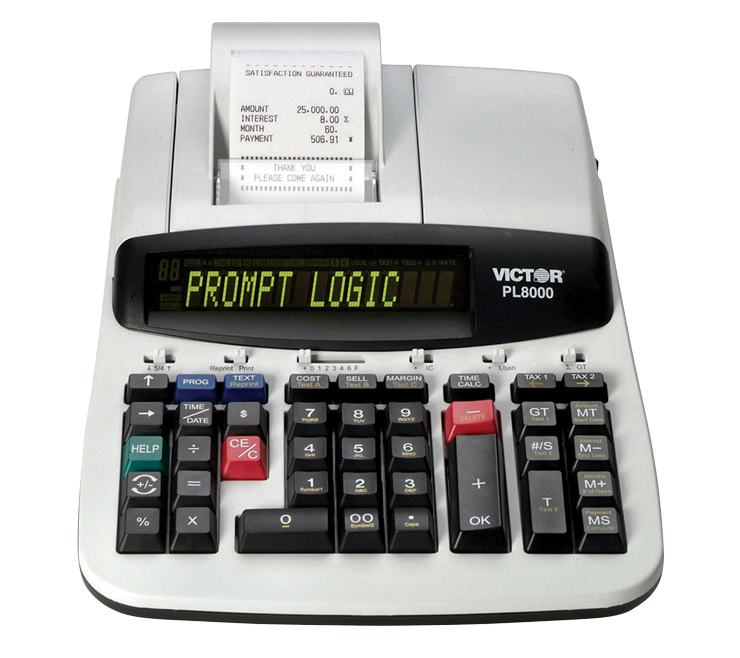 Innovative Prompt Logic™ guides the user in performing multiple functions, including: installment loans, time calculations, cost/sell/margin, currency and more! The only calculator with a HELP key, which displays and prints descriptions and instructions for using functions. Programmable with up to six user-defined alphanumeric text messages that can be printed on your tape. 2-color backlit dot matrix display, negative numbers appear in red. Cost/sell/margin keys make for quick and easy profit margin calculations. Constants in multiplication and division. For our 12-digit calculator option, see product #901.